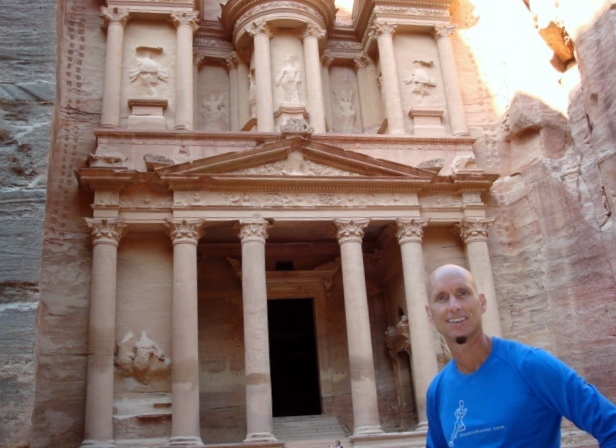 Our final leg of our 2011 tour “5 Wonders Under 25 Minutes” took place in Petra, Jordan. Petra is an incredible old city found in the red rocks at almost 3000 feet above sea level. Petra fittingly means “rock” in Greek and inhabited in 600 B.C. by the Nabataeans. Petra was chosen on the 2007 list of The New 7 Wonders of the World and a UNESCO World Heritage site in 1985. With their importance of “after-life,” the Nabataeans created many tombs by hand. 80% of original Petra has been destroyed over time and two earthquakes, but what remains is absolutely breathtaking. This is where the Petra Marathon and Half Marathon took place on Saturday September 10th calling the event – “run back in time” www.petra-marathon.com. After our time at the Dead Sea, we took a taxi for about 45 minutes to meet our our organizers and the marathon participants in Amman, the capital city of Jordan, on Wednesday afternoon. We spent the night in Amman and then all boarded a bus on Thursday morning to start our journey south to Petra stopping off at the Crusader fortress of Kerak. On Friday, we had an hour-long race meeting in the morning and toured Petra until lunch. Then on early Saturday morning, marathon and half-marathon participants walked down to the Treasury for the start of their adventure marathon and half marathon races. 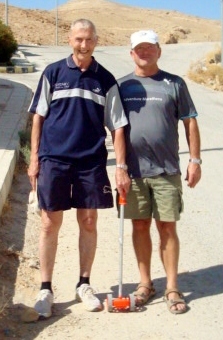 Two race organizers, Tomas Thomsen and Erling Nielsen, measured out the last mile of the route for me to race. Due to the extreme mountain conditions, the beginning of my mile was my slowest 1/2 mile on tour at 2:36, then after a bit of a panic I kicked in the last half mile in 2:17 finishing the mile in 4:53.15. I want to thank all the organizers at Albatros Travel who put on a great event for us. 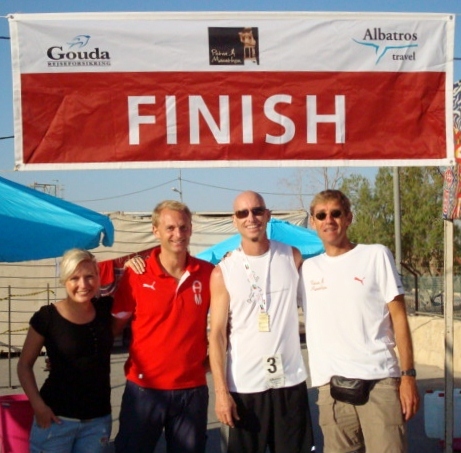 With their array of “adventure marathons” around the world, it made sense to team up with Albatros Travel to finish our tour of “adventure miles” in 2011. Below with me is Hanna, Lars, and race doctor. And thanks to all our www.OneMileRunner.com supporters who helped us complete our 4th event in 4 years. We completed “5 Wonders Under 25 Minutes” in a total time of 24 minutes and 31 seconds. We now look forward to shooting our new “Body Protection” video in October sharing the exercises in my training that kept me injury-free after these years of mile events. Posted in - My Daily Journal 2011, Author - David O'Meara. You really turned on the jets while approaching the finish line! Congratulations!!!!!!!! Congratulations on another exciting and inspiring tour! Looking forward to your return to Sarasota. Congrats on completing your adventure tour of one mile races under 25 minutes. You imagine things, make them happen and let the rest of us journey with you. Petra looks like a stunning historical site. Congrats to you and your team. Safe travels back to the US. Nice work, very useful Blogs,thanks!